Rosneft is eager to buy a 50 percent stake of TNK-BP; analysts and officials want to see how the deal might be structured. For the first time since the purchase of bankrupt YUKOS, Rosneft is preparing for a large deal. 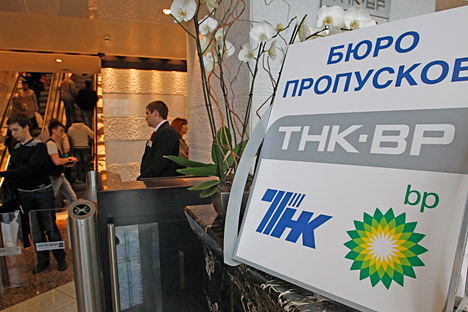 It informed British BP of an interest in buying its share in the Russian venture TNK-BP. The deal, which might cost up to 35 billion dollars, may make Rosneft the largest oil producing company in the world. Experts, however, believe that it will not solve the management problem in TNK-BP, and western analysts want to see how the deal will be hammered out. Following the AAR consortium (a group of billionaire partners known as Alfa Access Renova), Rosneft informed BP about its interest in buying the company’s share in TNK-BP. The parties agreed to start negotiations on the issue and signed a confidentiality agreement. Thus, the company confirmed its interest in TNK-BP whose shareholders are deep in conflict with each other. In June, Rosneft CEO Igor Sechin said that he “had never thought of such a deal.” The RBC daily newspaper said that Rosneft and BP signed an agreement on July 24. According to the newspaper’s source, this issue has not been considered by the government and the company’s board of directors yet. BP confirmed that it will start talks with Rosneft and also probably with “other interested parties.” The British company said in a statement that “BP welcomes the interest of Rosneft in buying the British concern’s share in TNK-BP.” Both parties emphasize that they cannot give a guarantee that the deal will take place. The BP's representative says, "It is too early to speak about the transaction structure, as Rosneft has just agreed to hold negotiations." On June 1, BP informed the AAR consortium, its partners in the venture, about its intention to sell its share in Russian-British TNK-BP. On July 18, Russian shareholders declared their determination to buy 25 percent of the stake at the current market price. According to experts’ estimates, it might cost 10 billion dollars. Rosneft finds many advantages in buying the BP’s share in TNK-BP. In particular, the deal will expand the company’s existing asset portfolio and create added value for all its shareholders. The company’s press service also stressed that it would be a powerful impetus to develop downstream and upstream projects both in oil and gas spheres. According to the Minister of Economic Development Andrei Belousov, the decision on buying assets by state-run companies should be taken by the government. He found it difficult to formulate the government’s position on the possible deal. “We could be for or against the deal, it really depends on how it is structured," the minister said. If Rosneft consolidates assets and then sells them all and privatizes, it will be a great approach.” The Energy Minister Alexander Novak considers the purchase of the BP’s share by Rosneft a favorable measure for the company’s capitalization but he finds nothing good in the situation when foreigners leave the market completely. The Federal Antimonopoly Service (FAS) has not received a request from Rosneft for buying a share in TNK-BP, but the Service will take a cautious position on this issue as “oil market monopolization is not the trend to be welcomed” by FAS, said service head Igor Artemyev. Nobody doubts that Rosneft will find the means for buying the BP share. According to Vitaly Kryukov, an IFD Kapital Group’s analyst, the company has its own shares (12.6 percent) on its balance, which can be offered to BP for its stake in TNK-BP in addition to cash money. Thus, BP will acquire a share in the Russian company capital and be able to lay claims to participate in offshore projects. The sale of BP’s share in TNK-BP will mean deterioration of the British company’s positions in the Russian market, and it is the share of business which brought the British company the largest profits in recent years (3.7 billion dollars of dividends for the last year alone), Nesterov added. Original version in Russian is available at RBC Daily.